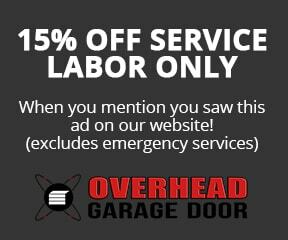 Garage Door Opener Maintenance - Overhead Garage Door, Inc.
Automatic garage door openers last, on average, 10-15 years. You can significantly lengthen the lifespan of both your garage doors and the opener by spending a little time once a year performing some basic maintenance. Read on to learn all about garage door opener maintenance to keep it, and your automatic garage doors, in tip-top shape. Before you begin doing any maintenance on your automatic garage door, take a look at the owner’s manual. It usually contains useful information about servicing garage doors and the right replacement products. If you don’t have the manual, contact the manufacturer. All you need is the brand and model number. You may even be able to find an electronic copy online on their website. If that doesn’t work, contact your installer who may be able to give you a copy of the manual. A big part of how to maintain a garage door is to pay attention to how it works when you use it. Is it opening and closing smoothly? Are there any scraping sounds while it moves? More often than not, your garage door will give you hints that something is not right well before it becomes a major problem. Act promptly and a licensed garage door technician will be able to prevent the issue from becoming more serious. This is better for your doors and your wallet. Now, let’s look at some of the actions you can take to maintain your automatic garage door in optimal working condition. At the bottom and to the sides of your automatic garage door you will see photo eye sensors. These prevent the door from closing if there is something blocking the way. Ensure that these sensors line up properly. Often, the sensors have a little red light that means they are aligned. You can adjust the sensors slightly to get them to line up with each other. Do a test to see if the sensors are working. Push the button to close the door. As it lowers, wave an object between the sensors. If the door reverses direction, the sensors are working well. If not, use a damp, clean cloth to wipe the sensors to remove any dirt buildup. Repeat the test as needed. Your automatic garage door has a safety feature that prevents the door from closing on an object or person. To test this function, put a small box or a brick in the path of the door. Close the door. When the door touches the item, it should start to go back up. If not, contact a garage door repair specialist right away. It takes under 10 minutes to lubricate your garage door’s moving parts. And this small maintenance work can add years of life to your automatic garage doors. The owner’s manual may list the type of lubricant you should use. If not, go with a spray lubricant and coat the overhead springs with a liberal spray. Use a white lithium grease for the chain and the screws. On average, your garage doors opens and closes about 1500 times each year. All this movement can take a toll on the hardware and cause it to become loose. Use a socket wrench to go around and tighten the bolts and roller brackets. Once a year is likely often enough to keep your doors going strong. If your automatic garage door is several years old, chances are that the rubber weatherstripping on the bottom is worn out. Check to see if this strip is cracked or missing bits. This little strip is what protects the inside of your garage from letting in rain, sand, dirt, and snow from outside. You can buy a replacement strip from any home hardware store. It comes in a long coil. You will need to cut it to the size you need. Then simply push the strip into the grooves with the wide angle of the flange on the inside. You should not try to adjust the tracks yourself. Leave that to the experts. But you can give the tracks a good cleaning to get rid of any spider webs and dust. Use a broom to make it easier to reach the tracks from the ground. You can also wipe the tracks with brake cleaner on a cloth rag. Make sure not to lubricate the tracks, this could cause the door to slip. It’s important to replace your opener’s batteries and bulbs once a year to ensure that your automatic garage doors continue to open and close when you need them to. First, unplug the opener and use the wall button to see if the door opens. If not, open the opener and put in a fresh battery. Next, replace the light bulbs with the ones the manufacturer recommends in the owner’s manual. Or bring the old bulb into the store and buy the exact same kind. Finally, put fresh batteries in your door remotes (the ones you probably keep in the visor of your car). The final garage door maintenance step is to clean your door on both the inside and the outside. You can do this more than once a year if you live in a dusty area or get a lot of snow. To start, fill a bucket with warm soapy water or special garage door cleaner. Wash the door with a sponge or rag. Then rinse the door off with your hose. If you have wooden doors, wipe them down with a clean dry cloth first. Then repaint or stain if there are chips or cracks. Not sure if your door can last another year? Read more about how to know if your door is beyond repair. Once you are done with the outside, move to the interior side of the door. Use a broom to scoop up any cobwebs. We hope this article on garage door opener maintenance was useful to you. Remember, you can be seriously injured when working with garage doors. Only perform basic maintenance and cleaning on your automatic garage doors. Call in a professional garage door technician for any repairs or thorough maintenance. Check out these top 5 signs it’s time to hire a garage door repair service.